I’ve often joked that I jumped straight out of reading the Saddle Club series into romance. What a lot of people don’t realize, is that it’s essentially the truth. I stumbled on Nora Roberts’s Irish Hearts series--you know, the ones with the horses--and instantly fell in love. I liked having two main characters have to learn to work together, fall in love, and still have to save everything they held dear. From there, I devoured as much Nora Roberts as I could. Then I broke into mom’s stash of romance books and fell head over heels for historical. They were heavily focused on the romance aspect of the story, not so much on the plot. These were mind kinds of books. I’m a sucker for a good lover story and the romance genre covers so many subgenres I was never at a loss for what to read next. 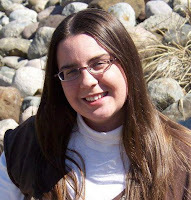 By the time I stumbled on urban fantasy and eventually paranormal romances, I was hooked. No matter what I wrote, it always ended up having strong love story at the book’s core. Still, urban fantasy stroked a chord in me--action. I like my fair share of chick flicks, but give me Die Hard or a Bruce Lee movie any day. Paranormal romance had more action than most, but none had it nearly as much as a romantic suspense novel. Killers, rapists, general psychos…and the main characters still had to find time to fall in love. This was the heart of a story to me. The things I loved to read, and therefore, loved to write. The common advice for authors is to write the kind of book you want to read… So I took that to heart. Monsters, magic, bad guys, and a love story to pull it all together. 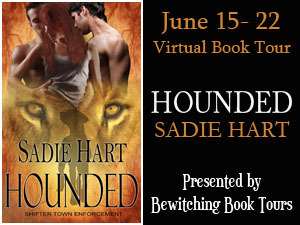 As a Hound for Shifter Town Enforcement, Lennox Donnelly is one of the best. But when one of her arrest warrants turns out to be for an innocent man, she’s determined to get to the truth. What she finds are dead witnesses and an untraceable magick–with a killer far more powerful than her. Now, to survive, Lennox will have to learn to rely on more than just herself if she’s to make it back to the men she’s come to love. 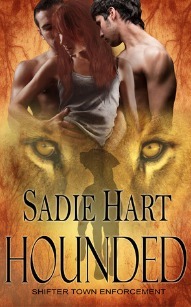 Sadie has generously offered an ebook copy of Hounded to a lucky commenter! All you need to do is leave a comment and tell us: what kind of book do YOU want to read? 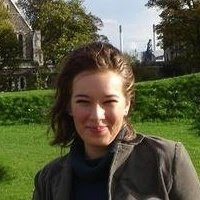 Giveaway is open worldwide and ends on 29 June 2012!